Chris Newsome captured the following image of Jupiter and Venus setting over Cardiff at 21:00 on the 1st September 2005. 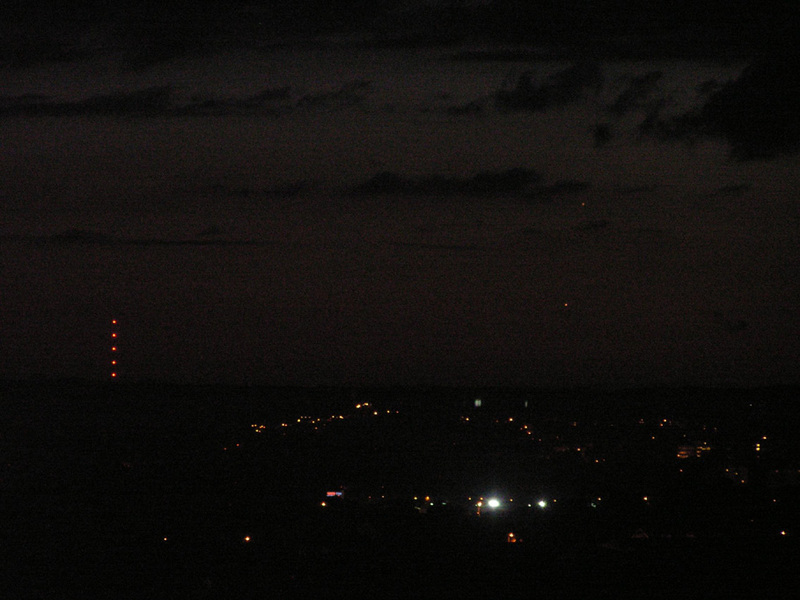 It shows both planets at right with Venus the brighter and lower one. The picture was taken with a hand-held Minolta Z2 camera on a 400 ASA setting, using a 1/10th second exposure at f3.5. 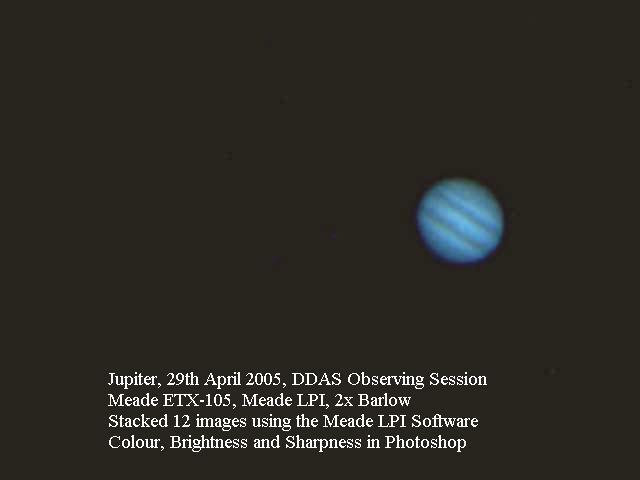 Chris Newsome took the following image of Jupiter on the 9th July 2005 from Basingstoke under poor seeing conditions. 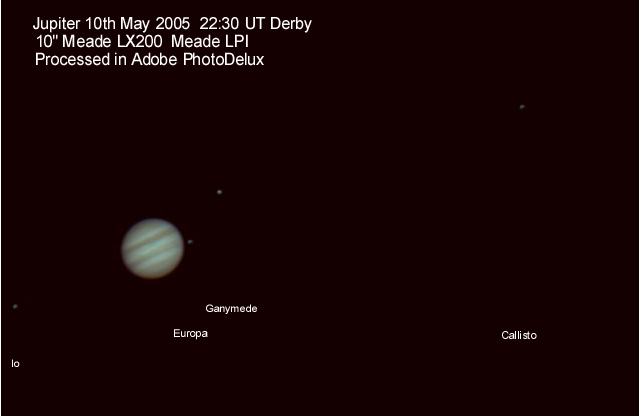 The following image of Jupiter and its moons was captured by Barry Ashforth at 22:30 the 10th May 2005. 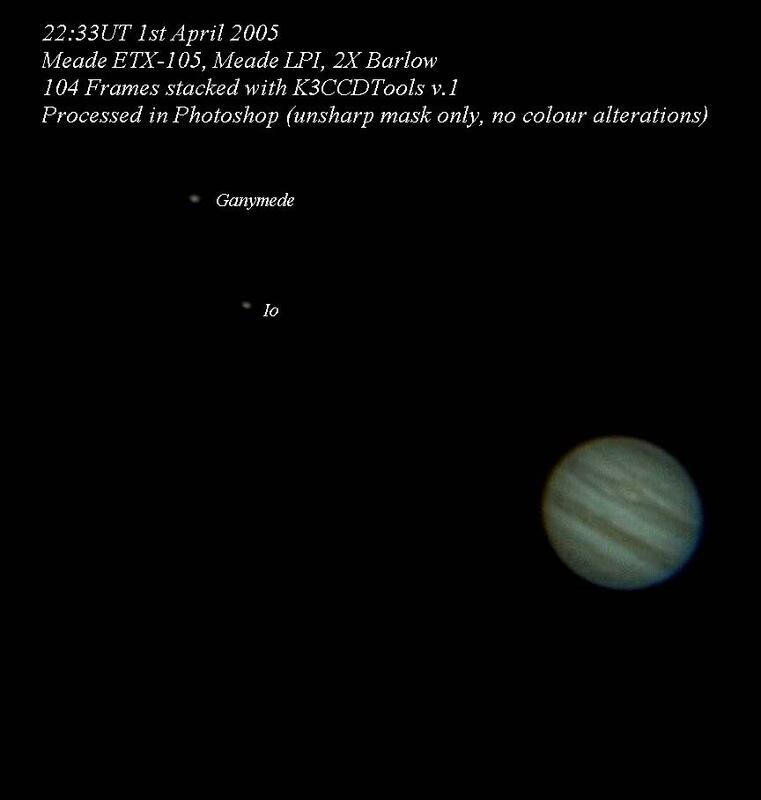 Simon Allcock captured the following image of Jupiter on the 10th May 2005. He used a Meade LPI camera and 2x Barlow lens attached to his 8" Meade LX-90 telescope. The image was adjusted in Photoshop to bring out (from left to right) the moons Ganymede, Europa and Io. Compare with Barry Ashforth's picture on the same night above. 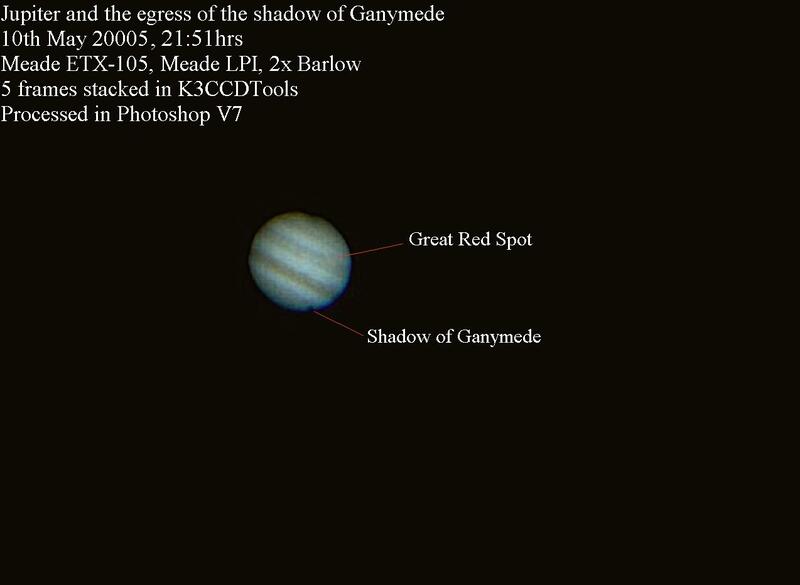 The following image of Jupiter with the shadow of Ganymede was captured by Chris Newsome on the 10th May 2005. Further details are given on the image. 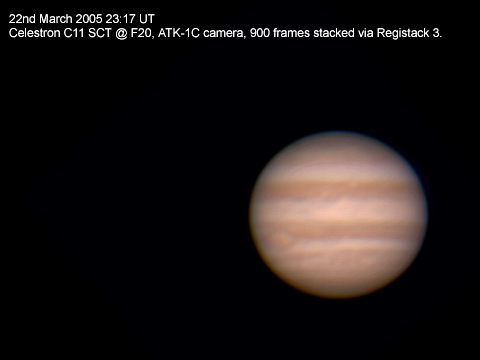 The following image of Jupiter was captured by Adrian Brown on the 4th May 2005 at 20:53 UT. He used a Celestron C11 SCT at F/10 with an ATK-1C camera. It shows some blue festoons in the equatorial belt and the moon Io is just visible as a point of light towards the right of the image. The following awesome image of Jupiter and its four Galilean moons was captured by Adrian Brown on the 3rd May 2005 at 20:16 UT. Technical details are as follows: Celestron C11 SCT @ F/10. ATK-1C camera with an IR cut filter. 900 frames captured at 5 frames per second with K3CCDTools 2.4.7. Best 100 frames stacked with K3CCDTools 2.4.7. Stacked image sharpened with Registax 3 wavelet filters. Final colour balance and brightness / contrast adjustment with Adobe Photoshop 7. 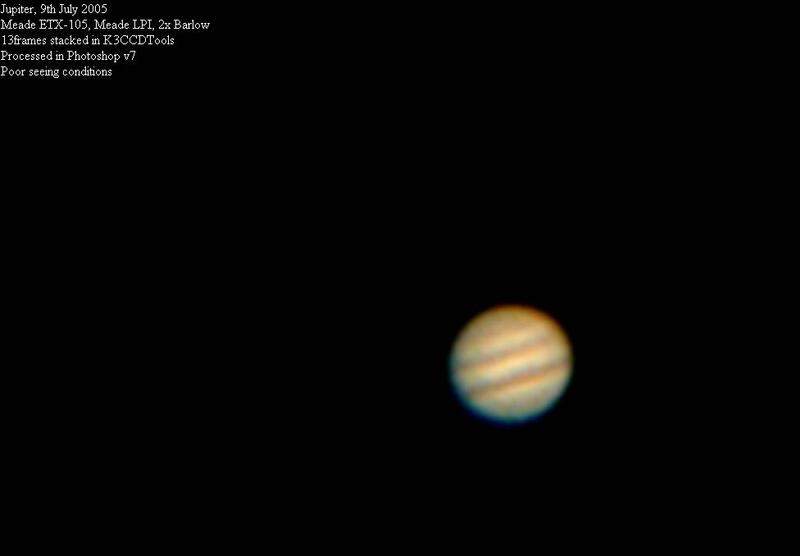 Despite poor seeing conditions Adrian Brown produced the following image of Jupiter on May 1st 2005 at 20:00 UT using his 11" Celestron CGE and an ATK-1C camera at F/10. The image comprises 100 frames stacked with K3CCDTools. 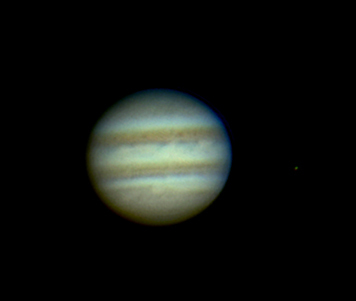 Further processing was done via Registax’s wavelet filters. The image shows some faint, blue 'festoons' in the Equatorial Belt and what looks like a white oval on the far left of the North Equatorial belt. The moons Europa (left) and Io (right) are visible to the right of the planet's disk. The following image shows Jupiter as imaged by Chris Newsome from the Society's Flamsteed Observatory on the 29th April 2005. 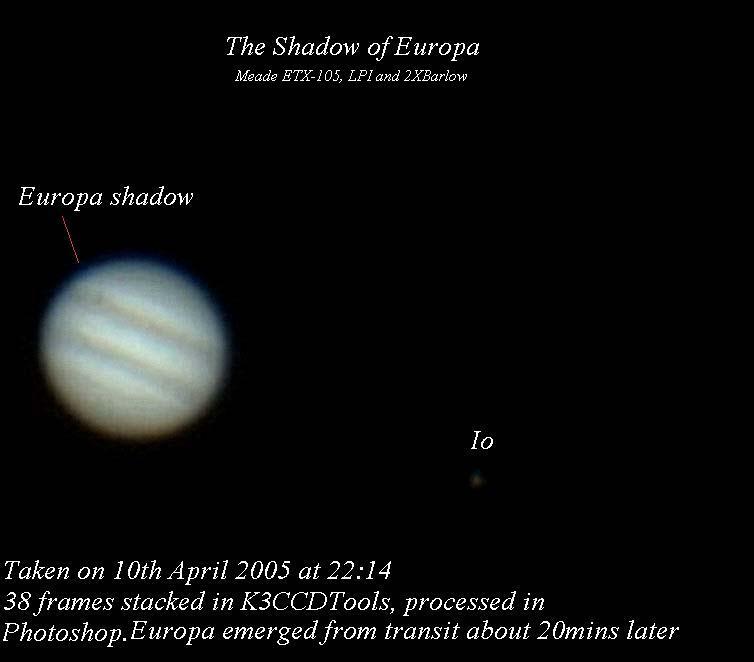 Europa was in transit across the disk of Jupiter on the 10th April 2005. Chris Newsome captured the spectacle with his Meade ETX-105 and LPI camera as the following two images show. 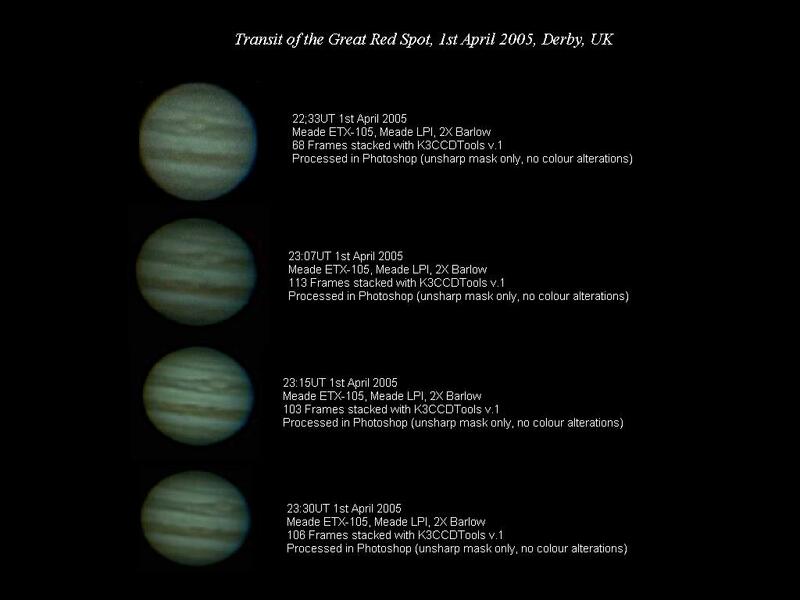 On 1st April 2005, the Great Red Spot transited the Jovian Meridian at 22:36UT. Chris Newsome armed with his ETX-105, an LPI camera and a 2x Barlow was at the ready and produced the following sequence of images. Here is a close up shot of the meridian transit and two of the Jovian Moons (Io and Ganymede) captured by Chris Newsome on 1st April 2005. 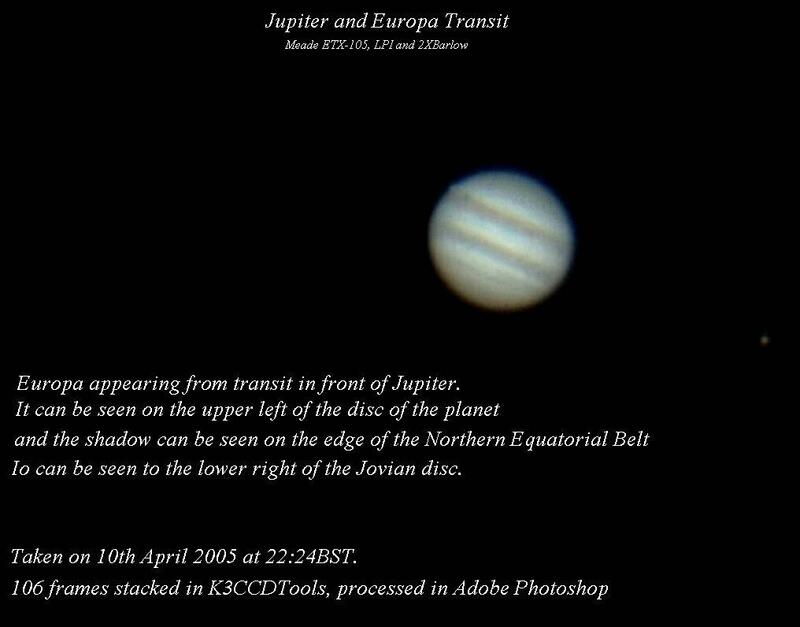 The following two images show Jupiter with the Great Red Spot and were taken 10 minutes apart by Adrian Brown on the 22nd March 2005. During that time the rapid rotation of Jupiter is evident with the spot changing slightly in position between the images. 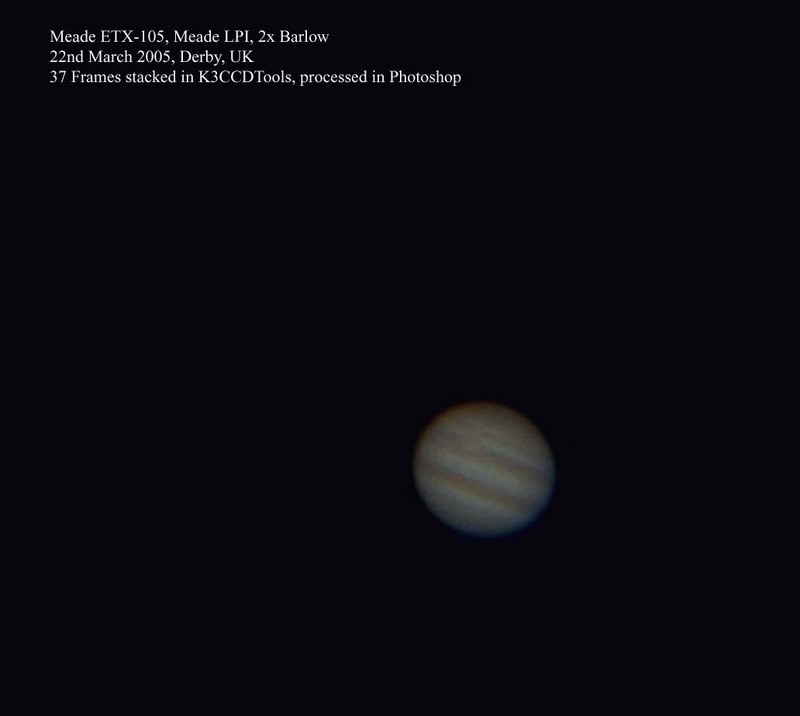 The following image shows Jupiter with the Great Red Spot and was taken by Chris Newsome on the 22nd March 2005. 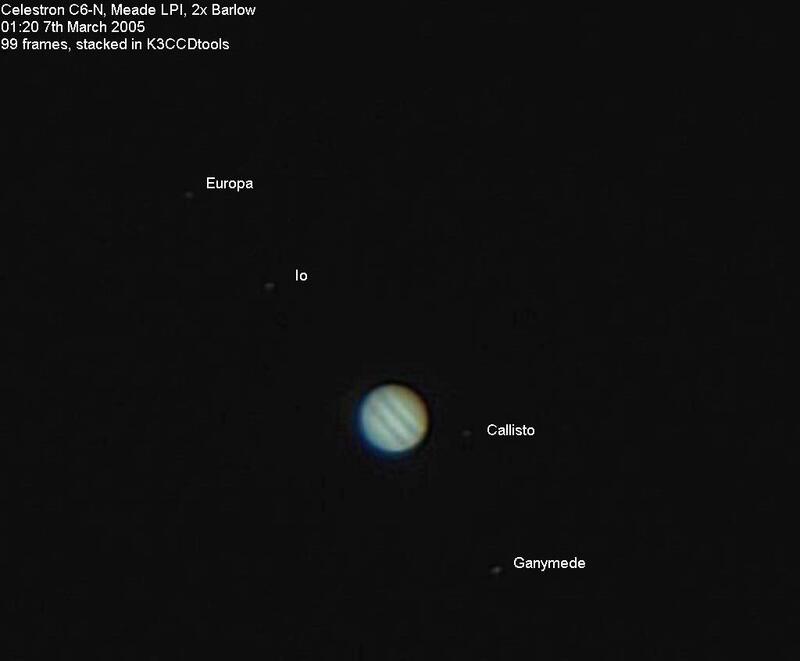 The following image of Jupiter and the four Galilean moons was taken by Chris Newsome on the 7th March 2005. Further details are given on the image. You may have to increase the brightness of your monitor to see the moons. This was Picture of the Week on the BAA website in March.